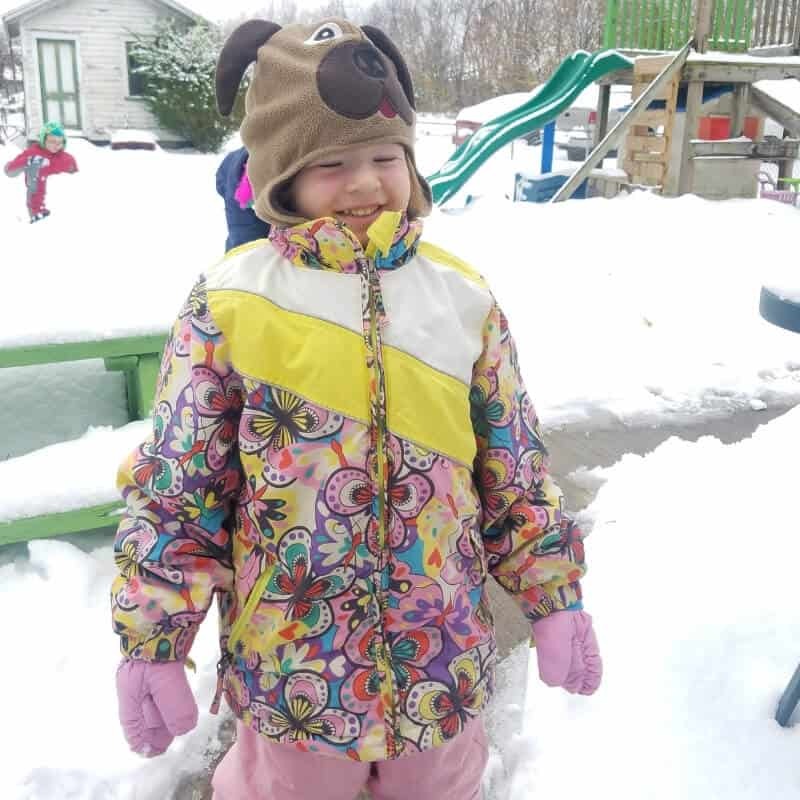 Follow these suggestions for dressing kids for snow play so they stay warm and dry! 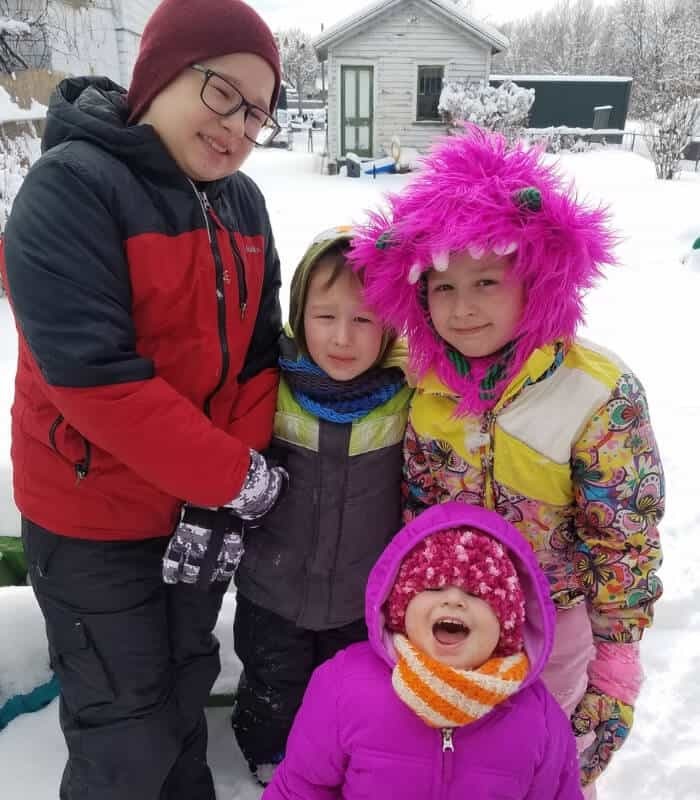 Do Your Kids Love to Play in the Snow? That’s not cool… it’s cold! Playing in the snow can be tons of fun, but not when the kids get too cold or wet. Most of the time, kids will complain about their gloves getting wet or snow in their boots…and let’s not forget about snow on your back if you’re not wearing bib snow pants! 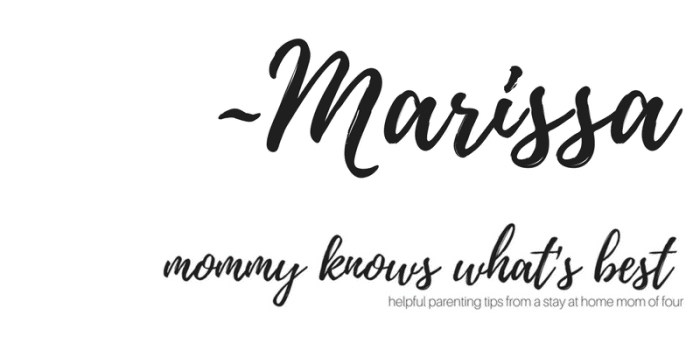 Here are some tips for how to dress kids for playing in the snow, with my number one tip for keeping them warm! 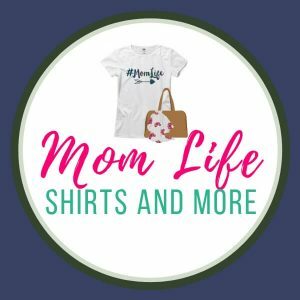 This post contains affiliate links, for which I may earn a small commission at no extra cost to you. Thank you! When my kids want to play in the snow, I dress them in multiple layers. Not too many so that they get too hot or can’t move, but just enough that they stay warm and don’t get too wet. It all starts with the first layer: footsie pajamas! 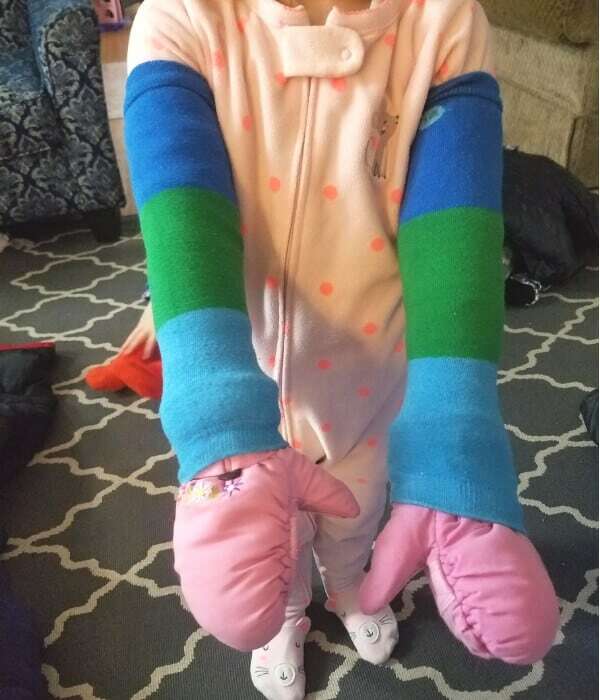 My number one tip to keep your kids warm and dry while playing in the snow is to put them in footsie pjs first, and then layer on top of that. They work perfectly to keep out unwanted cold snow around the ankles and back, plus they add extra warmth. Most of the time, after my kids undress from their other layers, they’re able to just keep on their pjs since they’re dry underneath. Depending on the temperature outside, we add another layer over the pjs, like a sweatshirt and sweatpants. If you have a turtle neck, that could be worn instead of the sweatshirt to help keep the neck area warm and dry. A hooded sweatshirt is also great for this layer thanks to the added benefit of having the hood that can be worn under a hat. Next comes the socks and gloves. We use old baseball socks for this layer, since my kids have quite a collection after playing for a few years. They’re perfect because they are worn higher than traditional socks and really help to keep snow away from the legs. We double layer the gloves. First a pair of basic stretchy gloves go on, and then a good pair of waterproof snow gloves. Bib snow pants are put on next. I really like bib snow pants for my kids since they stay in place thanks to the straps and keep snow out. Plus, if the straps are adjustable, you can buy the pants in a bigger size and get two or more years worth out of them as your child grows! We keep gloves in place with leg warmers. If you don’t have gloves with long cuffs, you could use something else to keep them in place. We use stretchy leg warmers over the cuff of the gloves to keep them on and keep snow out. Next are scarves and boots. Fleece scarves are awesome, but we really like fleece or knitted neck warmers to keep warm and to keep snow from getting down into shirts. Kids snow boots should keep kids dry and warm, but they should also be fairly easy to put on. I have to say that my favorite boots are ones that have the handles at the top to pull them on, like these ones that my daughter has. Finally, we put on coats and hats. Hats that secure under the chin are great for toddlers and preschoolers. They stay secure so that little ones aren’t constantly trying to get them back on while getting snow on their face. Coats go on last. Zip them up over the snow pants, and be sure to tuck in the scarf or neck warmer. If the sleeves have straps, you can fasten them so that they fit securely over the gloves. When we follow these steps, my kids can spend several hours out in the snow before they feel cold! As a bonus, since we layer well, when they take off the top two layers, they’re able to keep on their footsie pjs once inside. Then it’s time for a warm bowl of chicken soup and a mug of hot chocolate! How Do You Dress Your Kids for Snow Play? 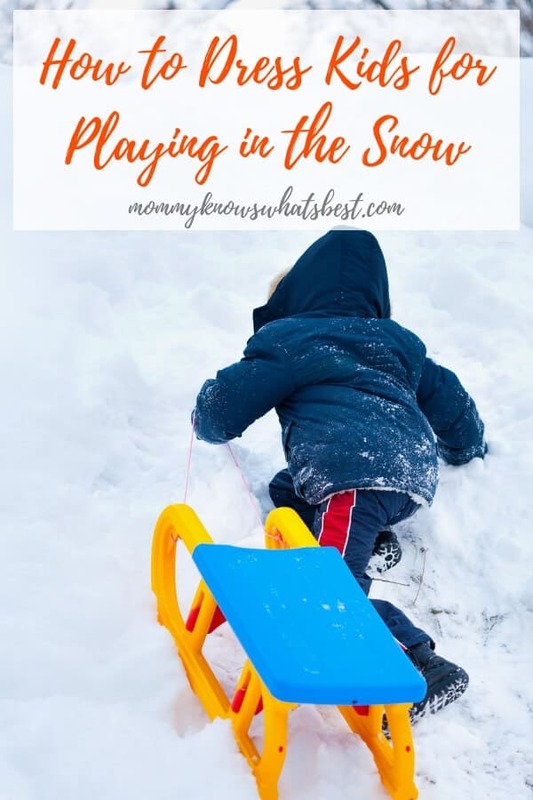 Do you do anything different for your kids when they go out in the snow? Please share what you do in the comments below! All great tips. Since I am older I hate the snow. Your munchkins are adorable! We don’t have snow here but I’ve always been told that layering is key.